So what's Hi Lo Gambler like? Hi Lo Gambler is my favourite HiLo game. It’s a beautifully simple game where you have to choose higher or lower on different cards from a standard deck (from 2 through to an Ace). Think of it as a game of Play Your Cards Right on steroids, minus Bruce Forsyth, but way more fun nonetheless. 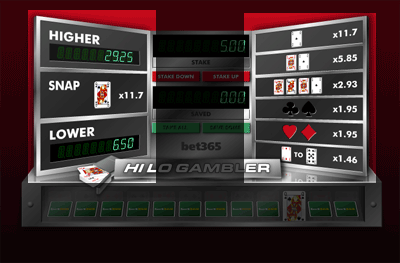 Hi Lo Gambler is fluid, exciting and offers all the wagering options you could want from a great hi lo game. It’s a simple format, but it does its job perfectly. 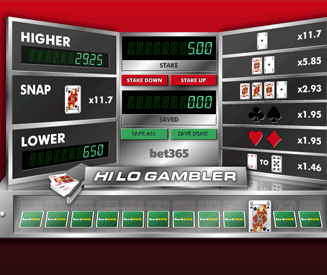 Hi Lo Gambler is the benchmark for all hilo games. And the fun rating? - 93%. Accumulating massive wins in Hi Lo Gambler through successive correct guesses is incredibly addictive. It’s hard to describe just how addictive it is, but I’d say it’s somewhere between Pringles and Heroin (the good kind though of course). The fact that you can turn 50p in to well over £100 in a few correct guesses is just awesome. Of course, losing a pot of money courtesy of an unexpected incorrect guess is always annoying, but it’s all part of the fun and excitement. All in all, the perfect game structure combined with massive potential wins makes this a game that scores so high on the fun-o-meter that it very nearly breaks it. How to play Hi Lo Gambler. Choose how much you want to wager at the start of one game. Choose higher or lower than the current card (or red or black etc. - there are a few wagering options). If you win, collect your winnings or roll them over on to another game for an even bigger win. Very straightforward, which is what you want from a hi lo game really. It’s easier to figure it out for yourself by just playing the game than it will be for me to describe it in words, but I’m going to go ahead and do it anyway. When you fire up Hi Lo Gambler you will be able to choose how much you want to wager in one game. This can be any milestone amount between £0.50 and £5000.00. Choosing what to wager on. The best part of Hi Lo Gambler is the fact that you can wager on a bunch of different things, not just whether or not the next card will be higher or lower. Higher or Lower (varying odds). Same (11.7x). The next card will be the same value as the last. Ace (11.7x). The next card will be an Ace. Ace or King (5.85x). The next card will be an Ace or King. Face Card (2.93x). The next card will be a J, Q, K or A. Black (1.95x). The next card will be a club or spade. Red (1.95x). The next card will be a heart or diamond. 2 to 9 (1.46x). The next card will be between 2 and 9. The odds on the higher or lower wager will vary depending on what the current card is. The less likely the outcome is (e.g. choosing higher instead of lower on a Queen), the bigger the return will be if you guess correctly. You can either aim for the initial bigger wins with longer odds, or play it safe and go for the more likely outcomes and build up your winnings that way. Collecting winnings or rolling the money over. If you have guessed correctly, you can either collect your winnings or roll the money over and try to guess correctly again. This could result in even bigger wins again thanks to the larger amount being wagered. If you can guess correctly a number of times in a row, your total winnings will become very sizeable. For example, if you start with £1 and guess red or black 6 times in a row correctly, you would win £107.21. It pays to be a little risky at times in this game. Your maximum win can be huge. Hi Lo Gambler is purely a luck game, so there isn’t anything strategy-wise that you can do to increase your odds of winning. If you always go for the most likely outcome, you have a greater chance of guessing correctly but the reward is less. If you always go for the least likely outcome, you have a lower chance of guessing correctly but the reward is greater. At the end of the day, however much you risk based on the odds and the card on show at the time is up to you. If you’re feeling lucky then go for it. The best advice I can give is to go with your gut instinct.